Saskatchewan artists celebrate 10 years of painting ‘en plein air’ across Canada with an exhibition and new book. 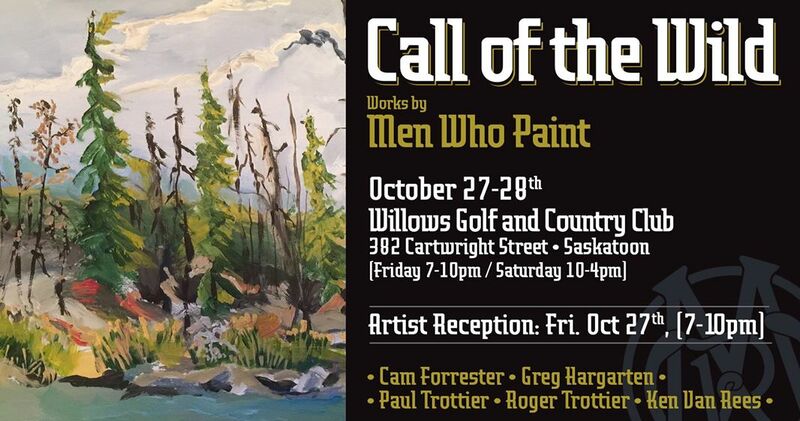 This October, marks a major milestone for Saskatchewan plein air artists Cam Forrester, Greg Hargarten, Paul Trottier, Roger Trottier, and Ken Van Rees. The group, also known as the Men Who Paint, has been exploring and painting Canada’s wilderness areas, for a decade. The event is being celebrated by the release of a book chronicling works done over the 10 years, and an exhibition of paintings at the Willow Golf and Country Club, on October 27th and 28th 2017. Since their formation in 2007, Men Who Paint have embraced plein air painting. Their travels have seen them at locations across Canada, including Yukon’s Ivvavik National Park, Ontario’s Algonquin Park, Alberta’s Banff and Jasper National Parks, Nunavut’s Ellesmere Island, and British Columbia’s Sunshine Coast, as well as Saskatchewan locations Prince Albert National Park, Emma Lake, Lac La Ronge, and Cypress Hills. Over 120 of the most engaging works painted in last decade have been reproduced in a new book “Men Who Paint: A Decade in the Works,” published in conjuction with the University of Saskatchewan and available at McNally Robinson and Indigo Books. “It’s been a real journey for us—we’ve learn a lot from each other, and have incorporated that into our individual styles. You may be able to see that at the exhibition, but it’s really evident in the book,” Hargarten said. All five members of Men Who Paint found their way to the campus, for various reasons. Greg Hargarten was treated to his first stay as a birthday gift from his wife. Ken Van Rees’s first experience at Kenderdine was teaching a soil science class there, while Cam Forrester, then a watercolour painter, sought to expand into oil painting. Paul Trottier was director at the Kenderdine campus from 2005 - 2012 and had the original idea for a group. It eventually grew to include five painters when he invited his father Roger, a long time artist, to join. With the Kenderdine campus as their base, the artists began painting the surrounding lakeland area working their way into Prince Albert National Park, and into the Canadian Shield of Lac La Ronge. They also started to travel to other areas of the province, then eventually the country. Although each artist has pursued their own careers and interests, the group still managed to come together two or three times a year to paint en plein air. In fact, the group, revisiting Ontario’s famous Algonquin park this October to commemorate the 100th anniversary of Canadian painter Tom Thompson’s death. This area holds a special place in the groups heart. Though they paint together and, without question, have had an influence on each other, each artist has developed his own unique style; approaches to colour and brush makes each artist’s work identifiable. They continue to challenge each other, creatively connected by a shared passion for painting en plein air.